26/10/14 – Note about the German release of the game. The documentary team was talking to Dave Ward who was looking at a new submission that Ocean had supposidly recieved. It was called Castle Capers, and it kind of looked like a cross between Schizofrenia (Quicksilva) and Top Duck. They reported that the game was ok, but needed some graphic work done on it. There was no indication of how it played, but it looked as if it was a flip screen adventure game of some kind. This was the last we heard of the game and it seems that Ocean never took it further and published. We have added the screenshots from the BBC documentary. David Ward obtains a disk submission called Castle Capers, and they check out the work. They claim that the game would need graphical improvements. So what happened to it?… Well, thanks to Maxx, the mystery has been solved already!… The game was held off for 2 years after rejection from Ocean Software, and later published on the Power House label in 1986 under the name of “The Secret of Kandar”. By checking the video shot and the actual screenshot, you can see its almost spot on! 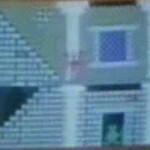 The game is also set in a castle, and it seems very unlikely that it isn’t the very same game. The game was also actually released by Ocean/QuelleSoft in Germany under the name of Das Spukschloß before Power House released it on their label later on. For whatever reason, Ocean were not happy to release it in the UK. Credits show the game to have been created by Andrew Taylor, who also created “Stunt Bike” for Ocean Software. This must have been his second submission, but was rejected. The Game was first released in 1985 by Ocean/Quelle-Soft in Germany.